Have you ever felt embarrassed or ashamed to smile due to the gaps in your teeth? If this is you then you’re not alone, explains the Dentist in Dubai. Almost 70 percent of the population between the ages of 35 and 44 have lost at least one of their natural teeth. Tooth loss can be due to tooth decay, accidents, injuries, or even gum disease. Luckily, missing teeth can be replaced by dentures, which are very affordable and rest on top of the gums, or dental implants, which are surgically fastened to the jawbone, and can be very expensive. If you are suffering from tooth loss, then deciding between dentures and dental implants, can be a challenge and you will need to consider factors such as overall health, lifestyle, and budget. When making a decision, whether to have dentures or Dental Implants in Dubai, here are a few things to consider, before making a final decision. Dentures or dental plates are not the best option for everyone, but the quality of dentures or artificial or false teeth has improved with time. For those who have an unhealthy jawbone, or if you have an extensive gum disease, full or partial dentures are the best option for you. 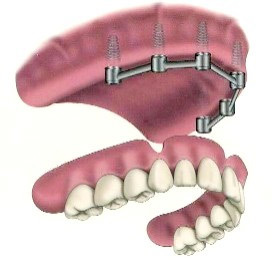 Conventional dentures are placed on a patient’s jaw about 12 weeks after unhealthy teeth have been removed. Talk to your dentist at the Dental Center in Dubai to determine which tooth replacement option is right for you. Schedule an appointment today, so you, as well as your dentist can work on your dazzling smile with either natural and permanent dental implants or affordable dentures.